James Murphy, military veteran. When he came home from battle, there was no detox from war, it was just over, all of the sudden. There was chaos, for both him and his family. He once had an incredibly bright future, with a job at Quantiqo as a Career Counselor and public speaker. After his service he has experienced absolute rejection from corporate America because of the invisible scars of PTSD that he bears. Diving became a way of thriving for James. Looking at pictures from before a dive, and after, you can see color coming back into his eyes. James went through the entire Dive Alliance program, including certifying to scuba dive, and then going on to become a dive instructor. James notices a difference. “I feel good,” he said. Compared to the reality of his day to day, feeling good is a relief. In his most difficult times since returning from war, diving has given him an opportunity to look forward to a new challenge. It has provided a relief. Local financial and emotional support can impact returning soldiers and their care givers. Many Utah families donate funds for soldiers. While those national non-profits have their place, money raised for Dive Alliance impacts our local veterans in powerful and poignant ways; ways that a national organization can’t touch for our Utah families. Recognizing the impact and difficulties that the caregiver faces is just as important as meeting the needs of the wounded veterans. 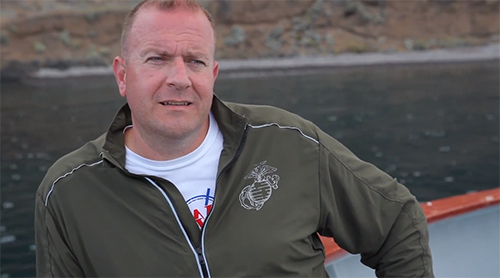 Hear what other veterans say about our most recent trip to Catalina Island.